Mayo is gathering important data on Rheumatoid Arthritis that has not been known before. We looked at one Mayo Clinic report last summer showing the incidence of RA is higher than expected and increasing in women. My readers know I’ve become a fan of Mayo researcher Dr. Sherine Gabriel especially as Mayo attempts to document the Rheumatoid Arthritis mortality gap and examine its causes. This week, Mayo Clinic reported on the risk to develop Rheumatoid Arthritis during a lifetime. Other studies have only been able to report an annual risk, which is much less. The Mayo Clinic video below is very short, but Cynthia Crowson encapsulates Mayo’s findings well. Read more of what Mayo Clinic uncovered about the risk of developing Rheumatoid Arthritis here. What do you think of this “Press release” that’s actually an advertisement? There is some embellishment if you ask me. Reminds me of a weight loss advert. But it could be useful if it’s accurate. 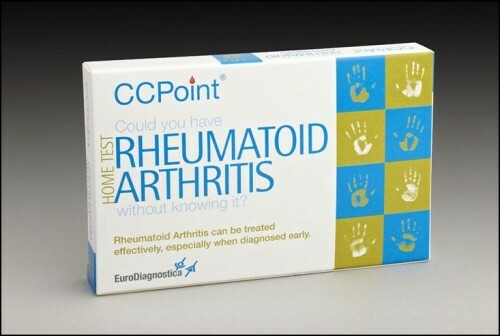 Click to see the ad for the CCPoint home Rheumatoid Arthritis test for yourself. This letter in Arthritis Research & Therapy from researchers in Spain discusses a study of carotid artery thickness in early Rheumatoid Arthritis. By 18 months after baseline, Swedish researchers found significant increase in carotid artery thickness in RA patients. By the way, Katie Beth and I heard an interesting talk at ACR about measuring arteries for prediction of the progression of the atherosclerosis of Rheumatoid Arthritis, showing which arteries are better predictors of Rheumatoid heart disease. Read the whole letter on atherosclerosis and Rheumatoid Arthritis here. Click here to read important related Swedish study on Rheumatoid Arthritis and atherosclerosis. 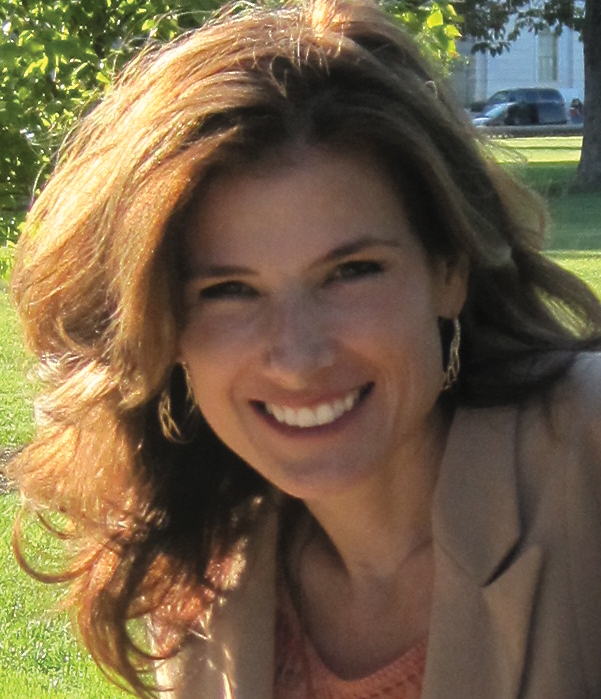 Thanks again Kelly for more outstanding info on what is happening now in the “RA world”. A couple things come to mind, firstly when I meet with my rheumy (on Valentines Day, how appropriate!) I will ask if he can refer me to a cardiologist for the ultrasound….I will keep you posted as to what he says, it took quite a bit to get the extra treatment for my continued pain out of him, and he’s a good guy too! Secondly regarding the RA test kit….interesting but I wonder how accurate it is? A friend of mine went to her dr for a RA test and she said her entire family has the “genes” for it…? I have heard this before and wonder if alot of people have the “genes” for auto-immune diseases that never become anything. My thoughts on this type of testing is kind of selfish, I can see a whole bunch of people testing “positive” then making appts at rheumys for further testing and making it even harder for those of us with this awful disease to see the dr when we need to OR to get proper attention because the offices will become bogged down with people running in to be tested…as we know there are not enough rheumys (of any quality) to go around as it is! Of course I would hope that anyone tested positive that really was POSITIVE to develop full blown RA could get help, I just see this as a gimmick that could muck up the overloaded system. Anyways, that is my 2 cents for the day…it will be interesting to see what becomes of the test kit….is RA becoming the “disease of the day”? Could this lead to more research for a cure or as mentioned on the FB page yesterday about the cost of meds, just lead to more meds to treat instead of finding a cure or even a cause! Good questions. I don’t know how accurate a home test could be. That is the key question. Early testing would be great if it worked. I don’t know whether treatment would be given though if there were not symptoms to confirm it anyway. My favorite thing is what the Mayo docs said at they end about helping people to know this is important. While I am glad to see a new at home blood test, I am worried about the many patients like myself for whom for whatever reason, our bloodwork defies our condition. Since the age of 18 I have had several of the symptoms for RA, morning stiffness, swelling,low grade fevers, fatique and flares,including symmetrical degradation of the knuckle joints in my pinky and ring fingers; some of the symptoms of Lupus,including a butterfly rash, sun sensitivity, lung inflammation and kidney inflammation, and a few other fun autoimmune symptoms thrown in like dry mouth and muscle weakness. It is enough for my Rheumatologist to treat it seriously with NSAIDS, Plaquenil, Prednisone and other drugs as needed. I am also monitored every three months. Yet, my CCP is normal, I have no Rheumatoid factor, ANA is negative, etc. Except for a little bit of anemia and a vitamin D deficiency, blood work is normal. As a result it took 10 yrs to get treatment. For years I have read press releases of new tests, and would run to get the newest factor or antibody checked only to come up empty-handed. The absence of positive labs and a concrete diagnosis caused me to be dismiss my condition and not take my illness as seriously as I should. It is only in the last couple of years that I’ve given myself permission to be chronically ill and care for myself as such. My doctor considers me in the Mixed Connective Tissue Disease category even though technically, my labs would put in me in the undifferentiated category. He says, “If it looks like a duck, quacks like a duck…” I know I am not the only one in this boat and feel lucky to have a doctor who believes me and treats me like I have a real condition. I just want to caution readers about an overreliance on bloodwork. I have had RA for 29 yrs and my bloodwork has MAYBE once or twice showed elevated something or other. I had no idea dr’s today were dx’ing so heavily based on labs. When I was dx it seemed to be all symptomatic. Granted, that was 1982. Five years ago, I was having some other issues, and having a great insurance plan, decided to go to the Mayo Clinic in AZ (close to where I was living at the time). Despite hardly being able to walk then, the dr. ran tons of tests of ALL sorts, and concluded I was healthy and basically all my immune disease was imaginary. Simply because my labs looked great. Now that is quite a change from all the rheumatologists I’ve had over the years, who treat what they SEE vs. what my labs show. From what I’ve read here, doctors seem to fall into one camp or the other, and that is scary. If you get a doc who only believes labs, you don’t get treatment if you don’t show the “right” results. I’d be in a wheelchair and unable to do much now if I had a doc treat me like that. Joint damage still happens with “healthy” labs. I’m living proof. Thank you so much for your post. This is the plain truth that I only put together by hearing from so many patients. It is not what is presented today from many sources. I know several people who were diagnosed long ago & they say they had no idea even whether their tests are postive or they actually had all those tests when they received treatment. Also what happened to you five years ago at Mayo sadly has happened to many patients I’ve heard from. And it happened to me too – so I believe it. Patients will have to make this issue known. I agree about not relying upon blood work. One of my early blogs pointed out how high is the percentage of patients w/normal CCP & Rf readings. And that those results can go up and down in patients. I’m sorry anyone dismissed you. That has happened to me a number of times and it is awful when the one you turn to for help acts as if you are not sick. I’m glad you have a better doctor now. The RA detection test seems odd to me. Not everyone’s blood test shows RA. May give people the wrong result if it is based simply on blood. Additionally, RA isn’t something that can be treated without a doctor’s intervention the way a yeast infection etc can be. Why test at home when you need to go to the doctor for treatment anyway? If someone tests negative will they wait to seek treatment even though they have RA? Seems like just another way for this company to make money from people’s fears. Yea, it is not a replacement for docs! What’s the point of a test like this? I’ve seen the data that shows that some markers appear before you ever get RA. Big deal. What are you going to do because of it? Can you prevent yourself from getting full blown RA once you have early markers? From what I know they don’t really know what causes it, so how could you hope to prevent it. It seems the only thing you can do is learn about what’s coming and wait for it to happen and get to a doc when it does. Sorry to be so terse. Having a rough day. hahaha. Yeah, I said it looked like a quick weight loss advert right? The fact that the have an at home RA test kit is laughable. How do the expect this to work? A doctor has a hard enough time diagnosing this disease, let alone doing it yourself. Lmao!!! This idea is absolutely ridiculous and idiotic. I have been going through this process for almost 8 months now, and still have no formal diagnosis. I have seen every specialist know to man and have been seeing my rheumy since late September. This is completely insulting and asinine. If there was a sure fire way to test for this disease, I would already know what’s wrong, and hopefully being put on proper meds so I can actually function from day to day. I know that there are home test and kits that work, but I don’t believe that this is one. It’s like people taking ovulations test. There were babies before we had these test, and people didn’t have a sure fire way in the beginning to make sure they were ovulating. Thank you once again Warrior Princess, for this extremely important info. I will be printing this out for my Rheumy before my next visit. I usually give him “verbal updates”, and he seems especially interested in what I’ve been learning lately! Roughly, the population of the USA is now ~308 million. If 50% female, that would be ~154 million. 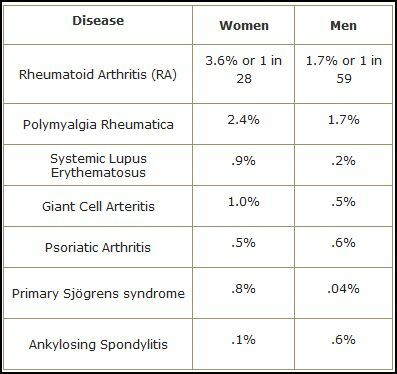 If 3.6% of these females get RA, that would be ~5.5 million RA+ women. Treatment with biologics such as antiTNFalpha injectables cost ~$20,000 per year. $20,000 times 5.5 million women = $110 billion per year of treatment. If a woman can have a positive CCP/ACPA test result within 3-6 months of developing symptoms of early RA, she could receive early aggressive treatment which might put the RA into remission before permanent erosive debilitating joint disease occurs. It’s too late for us. But what if that woman is your daughter or granddaughter? What kind of an RA experience would you want for her? Good point Caly. I’m not sure if the statistics work since the new 3.6 is a lifetime risk number as opposed to the annual risk number. I’d have to check on that, but its still a good point and the same point of the Mayo press release: that these numbers are staggering & should be used to help efforts for increasing awareness & research funding. I will do everything in my power to respond to this challenge to help save our daughters & granddaughters.